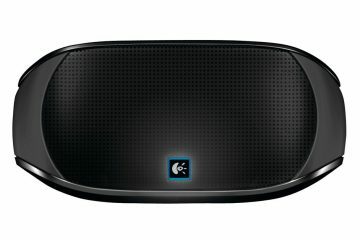 I have to admit that I’ve never been impressed with small speakers, even those designed for computer use. Even worse are those that promise big sound, but luckily we are quickly reminded by our ears and the laws of physics that this simply isn’t possible. While many of these type of speakers sport a stylishly compact design, when it comes to sound, their main reason d’être they do fall hard. Everything from a lack in volume head room to to tinny sound with no convincing midrange. That’s why I avoid these like the plague. 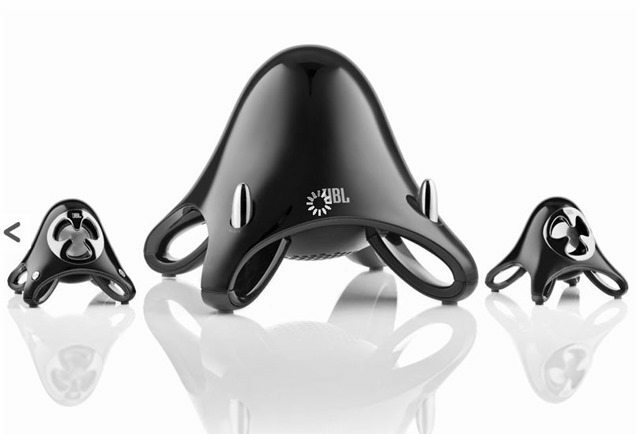 When I first saw the JBL Creature III, those very same thoughts came to my mind. It definitely looked stylish, but I doubted that these small speakers could sound any good. The size of the ultra small satellites and compact the subwoofer didn’t do much to change this first impression. Would these be any different? Do they fall in the stylish small, but weak category? Or are they the best of both worlds? Digital music players, desktop and laptop computers (all platforms), stereos and portable listening devices. As the name implies, the Creature III is the third version of the Creature series dating back to 2002. It sports an updated look that manages to stay true to the basic elements that the first Creature was known for. It’s also still a 3-piece system with many elements of the iconic, modern streamlined design that still looks fresh even 8 years later. The Creature III has a few notable changes worth mentioning. The subwoofer cabinet is now smaller in size, but it now also has a much smaller 3” driver at 15watts, compared to the previous 4-inch, 24 watts woofer. Even at 4” I’m not even sure it can be even categorized as a subwoofer, as many multimedia speakers use 3-inch and 4-inch drivers for midrange. The move to an even smaller 3” driver to handle the lower frequencies isn’t the smartest move. JBL should seriously consider moving up to a 6” sub as this would significantly enhance the already good performance. This would also means doubling the size of cabinet and cone, but we agree that gain in performance is worth the sacrifice in size. I do realize that this set was made with the style-conscious consumers that values the space-saving small size but an argument against this is the fact that most subwoofers will be hidden away from view under some desk. Also gone is the ambient light under each satellite speaker. We think that these would have positively complimented the current design, especially if a White light was used. They could have even added an effect where the light slowly “breathes” when lowering or increasing the volume. The lack of these lights we believe was a missed opportunity to add to the already awesome design. The two tiny satellites, have the exact same design as the subwoofer, minus the chrome accents around the driver and front firing drivers of course. With a name like “Creature” and other terms like “Landing”, “Came too earth”, “Attack of the killer speaker” and “Sci-Fi Speakers” being used in the market materials it’s very clear that these are somehow supposed to look like some strange alien creature from outer space. We kind of think of these as pushing more towards minimalistic modern art than UFO attack. No matter how you look at it, it certainly stands out and looks good. The only way we could describe is having an egg and putting a black piece of cloth over it, that’s how it looks like. We really liked the built-in stand as it continues the streamlined look of the speakers. These also make them look much bigger than they really are, minues the legs the speaker itself is basically the size of an egg. The drivers are exposed but are covered enough by protrusions in the body that they are protected from accidental bumps. The chrome element around the drivers look a bit too flashy for our taste and takes from what we consider a nice design. Maybe a more subtle brushed metal effect would have been better. One of the features we liked the most was the touch-volume control, a rarity on speakers of any price class. It works really well and at first you’d think that they would lack the level of control of traditional volume dials, but its very close. 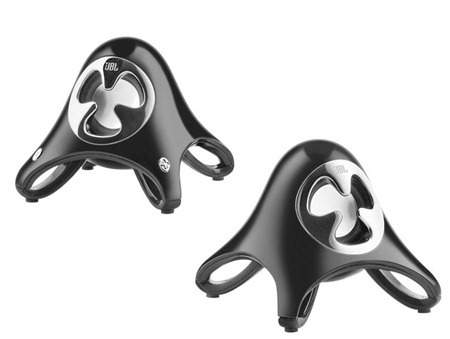 The buttons are very solid with no creaking sound or wobble and are tightly integrated into the body. A very cool touch, adding to the modern feel of the overall package. One thing we didn’t liked was that these touch controls looked just as tacky as the Chrome surround. A less flashy look would have been nicer. One thing we would like to see in future version of the Creature are backlit volumes keys that would make them easier to identify in the dark. Both satellites are connected to sub via reasonably thick cable, be aware that while it can disconnect from the sub, the cable is permanently connected to the sats. The Subwoofer is extremely small when compared against other multimedia subs, almost an exact copy of the sats, but only larger and just as stylish. It uses a down-firing ported design and stands on 4 legs that raises it of the ground. It’s also these legs that make it look a lot bigger than what it really is. JBL decided to put the Treble and Bass controls on the sub itself. These two controls have been designed in a way to nicely integrate into the design, they look nice and have a quality feel to them. No unwanted movements or sound, simply solid. The problem comes with the placement. We simply couldn’t think of a worse place to put these controls, unless we talk about the power button, which has placed behind the sub, between the many cables. It is expected and recommend to place a subwoofer on the floor, in this case under year desk. While adjusting your bass and treble is not something you’d be doing freqently, turning the unit on is something that hopefully you will. That means crouching under the desk each and every time to turn on the small little power switch behind the sub, that sits closely to the cables. This can be aleviated by placing the sub on your desk ofcourse, it certainly small it enough not to take a lot of space, but we feel that a subwoofer should be on the floor. What we would have liked to see is using another set of touch controls on the other satelite speaker that adjusts the treble/bass and a power button. Overall the sub does look nice and is small enough to be placed on your desk, but some might be annoyed by the placement of some of these controls. The Creature III took us by surprise when it came to performance. 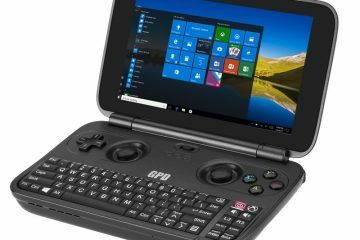 We connected it to both our Sony VAIO Z12 laptop and Nokia N900 smartphone. And boy were we surprised! While it could easily fill a room with sound, it shines when it comes to near field listening. With a 3-inch cone used in the subwoofer, we didn’t expect the system to really hit those deep notes, but it did provide enough base to support the mids and high, creating a a fairly uniform, full-bodied sound. 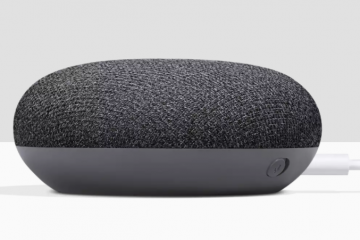 The effect was even more impressive when we hid the sub behind our desk: it was a bit strange to hear that fairly open and dynamic coming from just two tiny egg-sized speakers. With tiny sats and a very small sub, we didn’t expect audiophile quality music and the system does have its limits. These limits will only become evident beyond 80% of the total volume. While the sats maintained their composure throughout the volume range, the sub showed its weakness in certain difficult passages at higher volumes. This where the sub will begin to get sloppy and less defined, belching out unwanted tunes. This is isn’t uncommon, especially when a small cone has the difficult task of handling those low frequencies, needing to push lots of air in the process. As the volume gets louder, it becomes more difficult to keep up and the flaws become more evident. The satellites did surprising well, but if we had to nitpick we would say that it was a tiny bit bright and colored with certain songs, even after dialing down on the treble. We think JBL should leaves the sats as is, keeping the trademark tiny egg shape, but it’s the sub that needs to be increased in size. With such a low-powered we expected the system the to keep completely cool, but the top of sub gets slightly warm. Nothing to worry about, but thought it was worth mentioning. 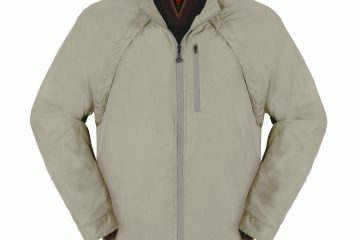 As we said before, the system is perfect for near-field listening conditions such as computers, laptop and even small players like MP3 players or smartphones. It will fill a room with sound, but the effect in larger areas is simply not convincing. Another of the systems’ strong points is the lack of any holes in the sound spectrum, but completes stops in the lower rannges where bigger 6 to 8” subs can tread. 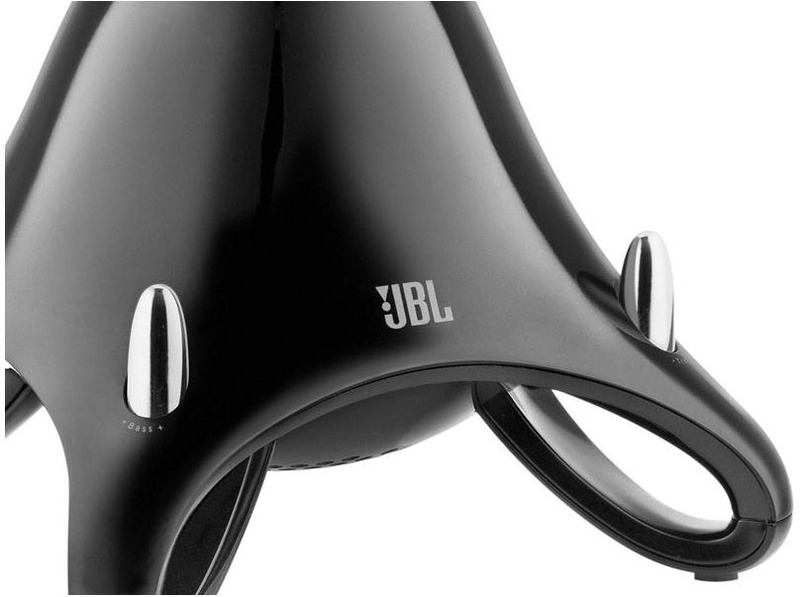 We do suspect that JBL’s was going for a small enough sub so that it could be placed on your desk, but we cannot stress enough how important it is to increase the the driver to at least 5-6 inches. Doing so would greatly improve the already good performance. JBL did a good job in finding a balance between extremely small size and good near-field listening. 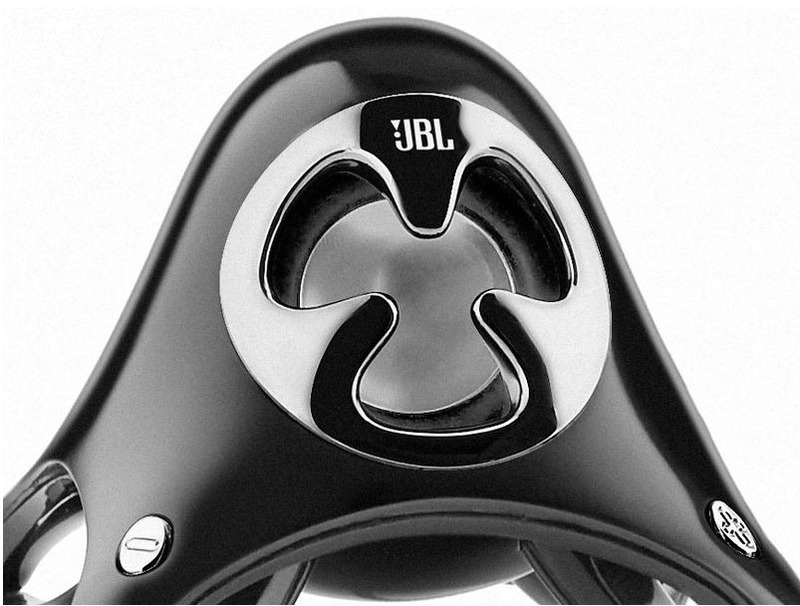 JBL’s Creature III stands out with a unique, modern design that still looks fresh after 8 years. It’s a slightly updated design that that looks even better than the original one. The overall system size is impressively small and should be perfect where space is tight or simply those that value stylishly small speakers, but we think that going for a smaller sub wasn’tt the best move. We also do miss the cool light effects that we think should return to the Creature series. We simply loved the touch volume controls, which provided an impressive amount of control, something we didn’t expect. The treble, bass and volume are placed on the sub, if you ask us, probably the worst place to put these controls. Treble and bass aren’t things you’ll adhusting a lot, but the power volume is hidden behind the sub, near all the cables are. Even if you do place the sub on your desk, getting to the power button is a bit of a stretch. Putting the sub os the floor will prove to be even more of a challenge. These control should be placed on the other sat and made into cool touch controls. But it truly impressed us with its sound, excelling in near-field listening. A system of this size has it limits, especially in the bass department, but it would be hard to get any better sound at this size. The JBL Creature III gets a 7.9 out of 10. Where are cool light effects? I agree thta this is the best computer sub-satellite system on the market. 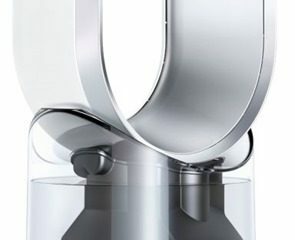 For 8 years the modern and si-fi design has stood the time. While you have just discovered it’s limits it produces clean full range sound. I agree the the small sub has limits but it is more than satisfactory for MP3 music and gaming on my computer. I actually bought two series I, one for my self and another for my son in college. Just enjoy your series III.